There are a flood of 'magic-themed' movies coming out or have come out. I will state for the record that I did see Burt Wonderstone. I saw it in a movie theatre with a total of three other people. I kind of liked the movie, but kind of not. There were parts of it that I enjoyed and I appreciate how the producers did their best not to make fun of magic, but instead make fun of the characters. In fact, I'm grateful that they did that. But overall, it wasn't a great movie. It seemed more of an 'insider' movie, because there were plenty of funny things for magicians but lay people wouldn't understand. I'm sorry to say I will not be going to see Desperate Acts of Magic. I'm judging it by the trailer and I just can't see it. It looks like it makes fun of both magic and magicians and I'm not into that. Magic frankly has enough problems without a movie making fun of it. I could be wrong, and the movie might be quite different, but the poster alone is enough to keep me away. It's hard for me to say that too, because there are many fine people who are in this movie and I know they put their hearts into it. I'm not suggesting that you skip it. If you like comedies and this type of movie, then by all means go see. But for me, I won't be going. I know they are showing the movie before the big SAM National Convention. A movie not directly about magic, but with many magic elements in it and many magic references as well is OZ-The Great & Powerful. I've seen OZ 4 times now at the theater. It is a sequel to the original movie The Wizard of Oz and the cast and director did an amazing job. The movie begins with a carnival magician named Oz who just so happens to gets caught in a tornado and swept away to the land of Oz. The opening shows a number of magic effects as well as a scene of actor James Franco presenting a magic show. Lance Burton was the magic consultant on this movie. When the wizard arrives in Oz the people are all thrilled because there is a prophecy that states a great wizard will come and help the people of Oz free them from the witch. Franco, as the wizard, thinks something is wrong because he knows he is a fake wizard, not the real thing. Here in lies the conflict and the resolution will only make you smile. It's now out on DVD and on iTunes, so please check it out. The next magic movie is a documentary, Deceptive Practice: The Mysteries and Mentors of Ricky Jay. This movie I will see and hopefully see more than once. Ricky Jay is serious about magic and about treating magic as an art form. He still puts comedy and humor into his performances but the magic is not demeaned in doing so but rather it is enhanced by it. I have the utmost respect for him and look forward to this movie. The final movie is called Now You See Me and it's a crime drama of sorts with illusionists as the thieves. I'll probably go see that just because it looks cool in the trailers. It seems to treat magic on a level above the 'party clown' stereotype and that is refreshing. And the movie has Isla Fisher doing magic and escapes....SOLD! Where do I buy my ticket? With so many wonderful stories and characters in the world of magic, we've got plenty of material to have great movies, and often even funny movies about magic without making fun of it. I have a feeling that the audience for Now You See Me will dwarf Burt Wonderstone, only because in one the movie looks cool and in the other the movie looked dorky. Plus, Now You See Me has Isla Fisher as a magician and that to me is GOLD! For the record, I loved The Illusionist with Edward Norton, The Prestige with Christian Bale and Hugh Jackman, and I also really liked The Great Buck Howard with John Malkovich and Colin Hanks. There are some really good movies about magic out there and let's hope they keep coming. The History Channel just announced a Houdini movie of sorts, I can't tell you how excited I am about that! UPDATE: To read my review of Deceptive Practice click HERE. 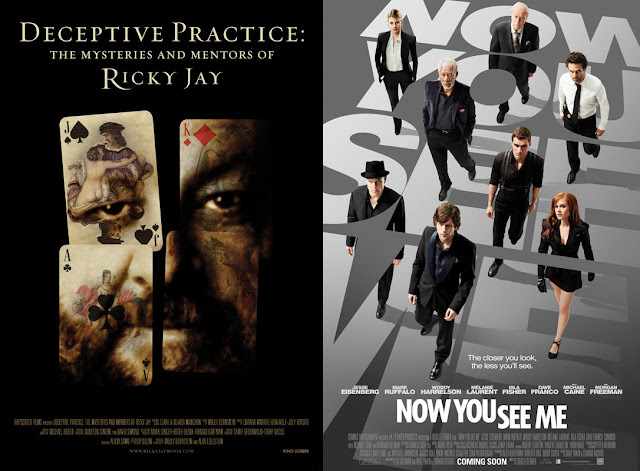 To read my review of Now You See Me, click HERE. I hope you'll give Desperate Acts of Magic a shot. It was a labor of love, and many people are really enjoying it. That was very kind of you to write. I will indeed give the movie a shot now afterall. Thanks Dean! I hope you enjoy it!